North Melbourne has run out handsome winners to avoid last place for 2017. The Kangaroos had an early scare, but outscored the Lions by 12 goals after quarter time. 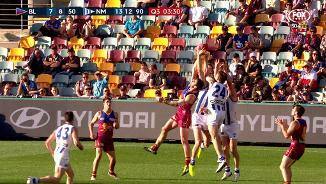 North Melbourne outscored Brisbane by eight goals launched from stoppages for the match. Todd Goldstein has regained some form in a strong performance in the ruck. He has served his team with 12 hitouts to advantage, helping to launch 65 points from stoppages. He has also recorded 15 disposals, four marks, five clearances and a goal. 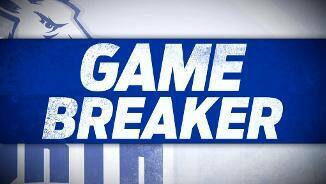 With Ben Cunnington kicking his first goal, North Melbourne have now registered ten individual goal kickers. This exceeds the Kangaroos' season average of 8.55 individual goal kickers per game, the fourthhighest average of all teams. North Melbourne has won 13 more centre clearances than Brisbane and is capitalising, launching five goals from the centre bounce. This matches the five goals the Kangaroos launched against the Hawks in Round 21. Lions InterchangeRyan Lester off due to an injury. Once again this season Dayne Zorko has been Brisbane's best player. The 2015 and 2016 Lions best and fairest winner has won five intercepts, recorded 25 disposals and been involved in a teamhigh eight possession chains ending in a score. Ben Brown has capped off a strong season with a great performance, kicking a careerhigh seven goals from 11 kicks and seven shots. He now has 63 goals for the season, the highest tally for a Kangaroos player since Wayne Carey kicked 69 goals in 2000. Alex Witherden has been a shining light for Brisbane off halfback. To go with his goal, the Round 17 nominee for the 2017 Rising Star award has recorded 16 kicks and 494 metres gained, as well as launching possession chains ending in 3.1 (19). North Melbourne has now launched 8.4 (52) from stoppages, now with four goals from ten throw in clearances to match the four launched from 19 centre bounces clearances. The Kangaroos were simply dominant in the third quarter, kicking eight goals within 25 minutes. Not only did they won five more clearances and record eight more forward 50 entries than the Lions, they also applied nine extra tackles for the term. With 51 points for the quarter, North Melbourne has compiled its biggest score in a quarter against Brisbane since 2000 and its biggest third quarter score against any team since 2015. Daniel Rich has produced another solid performance in what is turning out to be a big loss for Brisbane. He has won seven intercepts, amassed 12 kicks and laid four tackles with two winning free kicks. Unfortunately North Melbourne debutant Ben McKay has suffered concussion and has left the ground. The 21st selection in the 2015 National Draft managed nine disposals, a mark and three tackles in his first game at senior level. Kangaroos InterchangeBen McKay and is possibly out for the game. Kangaroos InterchangeSam Durdin off due to the blood rule. North Melbourne has now kicked eight goals for the term, for the first time against Brisbane since Round 2 2015 when it managed eight goals in the second term. Ben Brown now has five goals since quarter time and 61 goals for the season. North Melbourne has been dominant from the stoppages, winning nine more clearances than Brisbane. The Kangaroos have won seven fewer hit outs, but three more hitouts to advantage, and have outscored the Lions from clearances by six goals. Dayne Zorko has kicked Brisbane's first goal since the 25th minute of the first quarter, after intercepting a handball from Aaron Mullett. Four of the Lions' six goals have been launched from inside their forward half. North Melbourne have transitioned from the kick in following the poor miss of Michael Close, for Ben Brown to kick his fourth goal and the Kangaroos' ninth consecutive major. This season the Kangaroos have launched a score from 6.5 per cent of kick ins. North Melbourne has now kicked 8.2 (50) since its opening quarter term of 1.8 (14), while Brisbane has scored 0.5 (5) following its first term score of 5.0 (30). In this quarter the Kangaroos have recorded 19 kicks at 95 per cent efficiency. North Melbourne has jumped Brisbane to start the second half, with 81 per cent the play inside its forward half. The Kangaroos have been in possession for 75 per cent of the opening six minutes, and have kicked three goals from four entries. Ben Brown now has three goals since quarter time, as the Kangaroos launch their third goal from centre bounce clearances. Trent Dumont has six clearances for the match, three of which have launched scores for North Melbourne. The ball was inside the North Melbourne forward half for 71 per cent of the first term, yet Brisbane led by 16 points. Play was inside the Lions' forward half for 56 per cent of the second quarter, yet the Kangaroos won the stanza by 20 points. North Melbourne is now in front after Ben Brown again kicks truly from his second set shot for the quarter. The Kangaroos have improved their ball control with 71 per cent of kicks to short options, up from 58 per cent in the first quarter. Shaun Higgins has continued to have an impact in the second term, kicking his first goal from his third clearance for the term. Across the match he has registered seven forward 50 entries and 471 metres gained. Kangaroos InterchangeSam Gibson off due to the blood rule. Brisbane has kicked five consecutive behinds in the second quarter after five straight goals in the first term. This quarter, all of the Lions' shots have been from outside 40 metres or from an acute angle. The Kangaroos have had 11 shots in general play and have only managed 1.7 (13) in return. Jed Anderson has taken North Melbourne's fifth snap resulting in a score, however all five have only managed behinds. Ben Brown has kicked his 57th goal of the season as North Melbourne gathers in Brisbane's lead. The Kangaroos' have a forward half kicking efficiency of 69 per cent this term, up from 48 per cent in the first quarter. The script has been flipped in the second term, this time with the Lions managing one behind from five forward 50 entries while the Kangaroos have converted from just their second inside 50. North Melbourne hasn't registered as many behinds (eight) in the first quarter with just one goal since Round 20 1983. In that match the Kangaroos also kicked 1.8 (14) to quarter time against Geelong. Shaun Higgins racked up 11 disposals including ten kicks to quarter time, recording a gamehigh 358 metres gained and delivering the ball inside 50 on five occasions. Unfortunately, he also turned the ball over five times and managed two behinds. An intriguing first quarter sees the Lions take a 16point lead to quarter time despite having seven fewer shots and four fewer scores. The Kangaroos won nine more clearances and recorded ten more forward 50 entries, but managed one goal from 12 shots. Brisbane has found the ability to create easy shots, with four of its five goals kicked from within 15 metres of goal. North Melbourne has just managed one of its 12 shots from this distance, in turn converting its only major. Brisbane has been clean with its disposals, with a kicking efficiency of 76 per cent compared to just 49 per cent of North Melbourne. 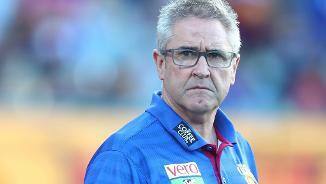 Incredibly the Lions have kicked four goals from four shots, while the Kangaroos have managed 1.8 (14) from 12 shots. The Lions have looked very dangerous on the outside, with eight more uncontested possessions than the Kangaroos and playing on from marks on 15 per cent more occasions. Two of their three goals have been launched from defensive 50. North Melbourne is on top across the ground but has not been able to convert into major scores. 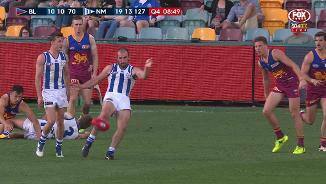 The Kangaroos have won seven more clearances than Lions but have let themselves down with just 13 per cent kicking efficiency from 15 kicks inside 50. 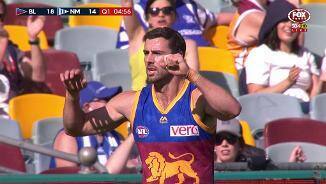 Tom Rockliff has got on the end of Brisbane's second goal launched from an intercept. He has now kicked 16 goals for the season, just two behind his careerhigh of 18 goals in 2012. North Melbourne has the quick reply, with the centre clearance from Trent Dumont setting up Sam Durdin. The Kangaroos have scored from 31 per cent of their centre bounce clearances this season, the secondhighest percentage recorded by a side. Brisbane has made North Melbourne pay with a goal from its first forward 50 entry. The Lions have scored a goal from 28 per cent of their inside 50 entries this season, the secondhighest percentage recorded by any side. North Melbourne has completely controlled field position in the opening moments, with the ball inside its forward half since the opening bounce. Unfortunately for the Kangaroos they have only managed four behinds, with three coming from general play. North Melbourne's offence has fallen from sixthhighest (96.6 points per game) to Round 10 to just the 15th-best (80.6) since. The Kangaroos have dropped their ball use in the corridor from 24.2 per cent (ranked first) to 17.2 per cent (ranked 10th). 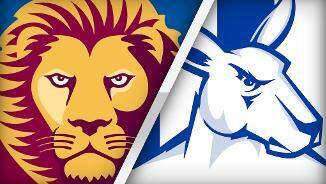 North Melbourne has won seven of its last nine games against Brisbane Lions, including the last three by an average of 63 points. This is just the 11th match in VFL/AFL history between the bottom and secondbottom teams heading into the final round. Since Round 10 the Lions have shown promise, such as improving their kicking efficiency from 63.6 per cent (ranked 17th) to 68.0 per cent (ranked 2nd). Brisbane has averaged a goal from 29.4 per cent of forward 50 entries (ranked first) in this period. Welcome to Gabba for the Brisbane Lions v North Melbourne Round 23 clash. 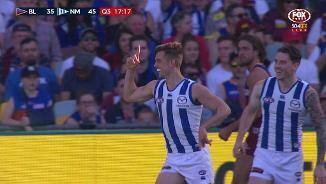 Rd 23, 2017: Match highlights All the match highlights from North Melbourne's 51-point defeat of Brisbane. POWER forward Ben Brown kicked a career-high seven goals as North Melbourne avoided the wooden spoon with a 51-point hammering of a dreadfully disappointing Brisbane Lions at the Gabba. After a first half that showcased the worst of the competition's bottom two teams, the Kangaroos put the foot down with an eight-goal third term on the way to a 19.16 (130) to 11.13 (79) victory. North Melbourne kicked 18 goals to six after quarter-time and could finish as high as 15th depending on other results. It is the Lions' first wooden spoon since 1998 and a poor way to finish a promising year. The silver lining is they will now take the number one pick to November's national draft. Brown was the star on a warm Saturday afternoon, beating his previous best of six goals kicked earlier this season against both Gold Coast and Essendon. 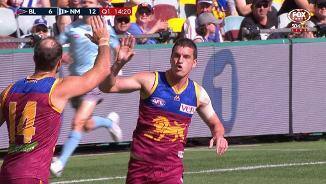 The 24-year-old got the best of impressive young Lions defender Harris Andrews, finishing with 14 disposals, nine marks and 7.2, kicking goals from strong marks and general play. His 63 goals for the year moved him just one goal behind West Coast's Josh Kennedy in the Coleman Medal race, although Joe Daniher (60) and Lance Franklin (59) have matches to come. 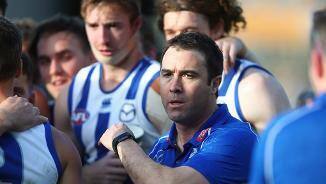 "He’s had a fantastic year, just a great year," coach Brad Scott said. "Everyone’s seen the marking, the goals and all of that stuff, but the players in our team know just how important he is in other aspects too, he’s just become a very complete forward." After a week of protesting how desperate his team was to win and avoid finishing last, Scott was delighted. His team was hungrier from the outset, dominating the Lions around the clearances (47-30) and contested possessions (144-126). "I thought the endeavour and the effort was really good," he said. "It’s always difficult when theoretically there’s nothing to play for and no carrot for winning." Shaun Higgins (29 disposals and two goals) was magnificent in the midfield, while Trent Dumont (26) found plenty of the ball and curbed the influence of Lions skipper Dayne Beams (18). One sour note for the victors was debutant Ben McKay being stretchered off late in the third quarter after a head clash with teammate Sam Durdin. The Lions were best served by Daniel Rich, who had 24 disposals and was desperate defensively, and Alex Witherden (27). They were poor and off the pace from the outset though. 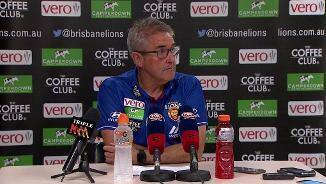 "We didn't play well today," Lions coach Chris Fagan said. "They killed us at clearance, particularly at the centre bounce. "We're really disappointed that we lost a really important game for us, in terms of not wanting the wooden spoon, by that margin and in that manner." Both teams went to great lengths during the week to explain how they wanted to avoid the spoon at all costs, although it was hard to tell in the first half. The skills from the two sides were deplorable. North Melbourne kicked seven behinds, interspersed by a Durdin goal, in a woefully inaccurate first 15 minutes. And it wasn't just the young guys who used the ball poorly, with Higgins and Ben Cunnington missing two gettable shots each, and Lindsay Thomas, Luke McDonald and Shaun Atley also missing kicks that would disappoint them. Every time the Lions got the ball, they scored, kicking five straight – four from the goalsquare – from nine entries in the first term. The scoreboard changed in the second quarter, but the quality didn't. The Roos kicked four unanswered goals, two to Brown who finally shook free of Andrews. 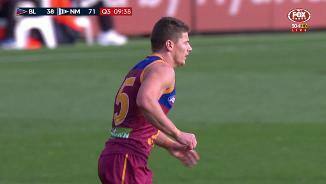 One moment of comedy saw 175cm Dayne Zorko rucking a boundary line throw-in against 199cm McKay. It nicely summed up the strange nature of the contest. 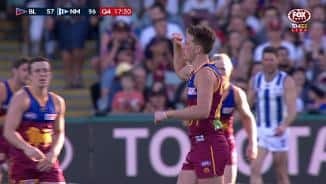 Brisbane Lions: Ryan Lester copped a head knock in the final term and was helped off by trainers and did not return. 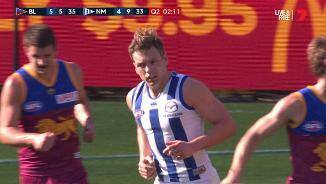 North Melbourne: McKay fell to ground heavily in the third quarter when he clashed heads with teammate Sam Durdin as the pair attempted to spoil a marking contest. McKay was stretchered off and did not return. 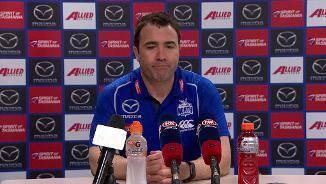 "He’s in a bit of a bad way," coach Brad Scott said post-match. "We think he’ll be OK but he’ll stay in hospital for observation." Durdin had his head bandaged and came back out in the final term. End of the line for both teams. That's eight straight years without finals action for the Lions and their first spoon since 1998, while the Kangaroos miss out for the first time since 2013 but avoid finishing last.